The movie Ghost Town: trailer, clips, photos, soundtrack, news and much more! Does this movie remind you of something with Patrick Swayze? Have you seen ghosts in your neighborhood recently? 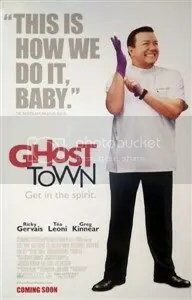 Ghost Town is an upcoming comedy starring Ricky Gervais, Greg Kinnear and Tea Leoni.